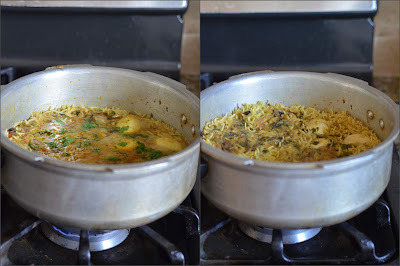 Coming to the second day of mini thali, its a simple yet fulfilling weekend lunch.Most of our weekends would be either chicken or egg based recipes.I always make an elaborate lunch on weekends, at the same time,I cook quick recipes so that I can spent time with the family.This egg biriyani is one such quick and easiest recipe,needs just 30 minutes to finish.Pairs very well with simple raita and rich,creamy curries. Soak the basmathi rice in water,grind the given ingredients given' to grind' to a coarse paste and keep it aside. Make few slits on the boiled egg and set it aside. 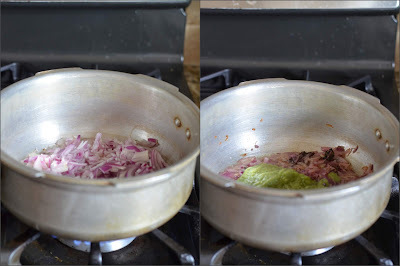 Heat oil and ghee in a pressure pan.Do the tempering with the given ingredients,saute the sliced onion till golden.Add in the ground paste and fry it till the raw smell goes off. 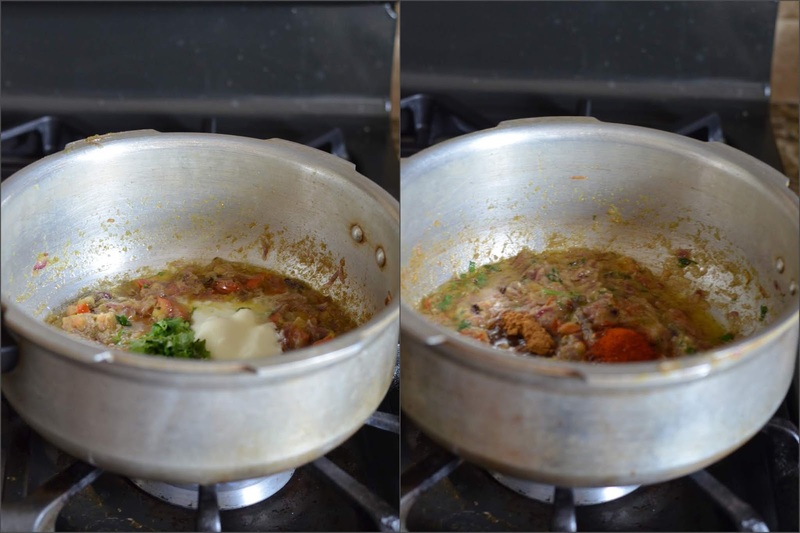 Add in the chopped tomato,yogurt and coriander leaves.Cook it until the tomato is mushy.Now add in the spice powders and salt.Give it a mix. 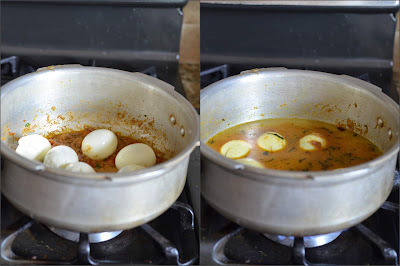 Add in the boiled eggs and mix it well till the masala coats very well.Add water and allow it to boil. Once the water is boiled,add in the soaked rice.Now goes in the lemon juice,chopped coriander leaves and a tsp of ghee if needed. Let it cook for 5 minutes or till half of the water evaporates.Close it with the lid and pressure cook it for 2 whistles in a medium flame.Put off the flame and remove it once the pressure subsides.Mix it with a fork gently. 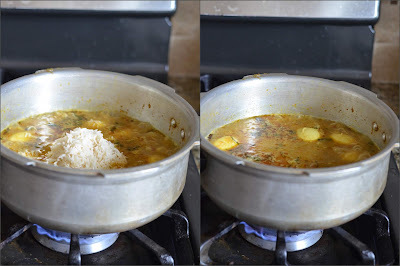 Wow, look at those prefectly cooked rice grains. Ultimate weekend thali, though you said its simple, for me its a real feast Nalini.. Lovely plating there. The thali looks so fantastic Nalini. 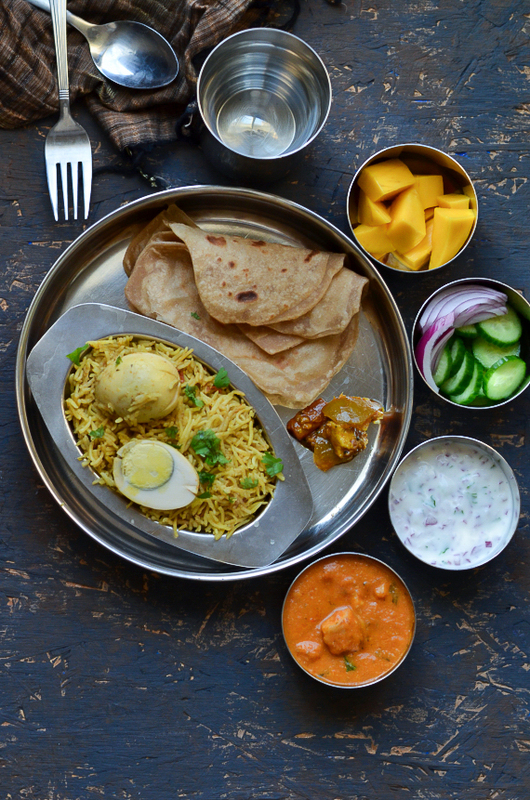 It has all my fav dishes and I really can't believe that this is a simple thali. 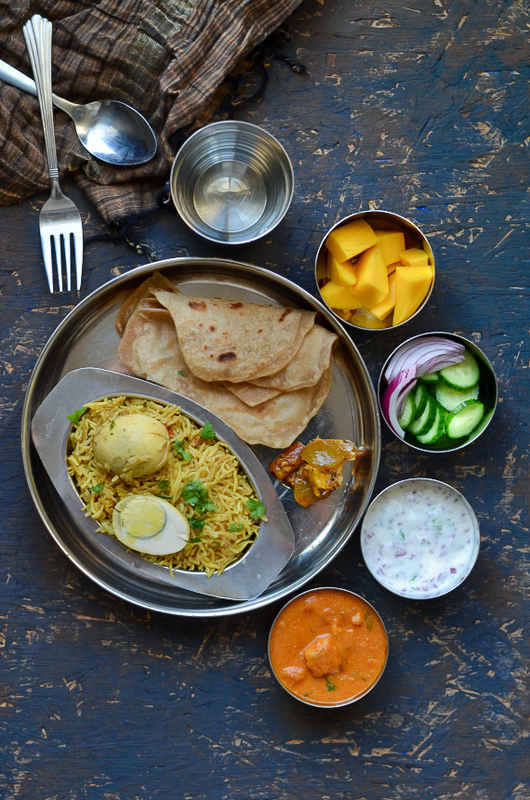 That egg biryani looks super inviting..
Nicely presented thali, Nalini. 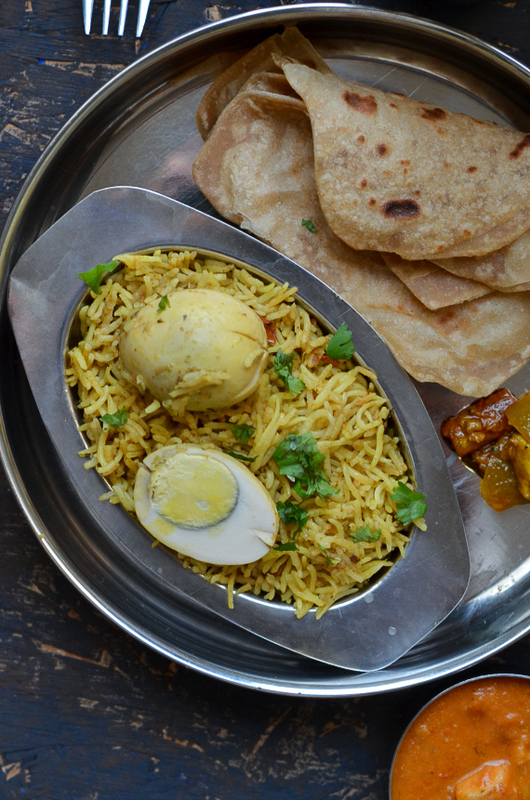 I am sure egg lovers will appreciate the Biryani but the rest of the thali sounds yumm to me. egg biryani looking great and very inviting platter.